Marshall running back Tyler King, right, breaks away for a big gain during an Oct. 14 Conference USA football game against Charlotte at Joan C. Edwards Stadium in Huntington, W.Va.
MURFREESBORO, Tenn. — Marshall led wire-to-wire while picking up its fifth straight victory Friday night during a 38-10 victory over host Middle Tennessee in a Conference USA East Division contest in the Volunteer State. 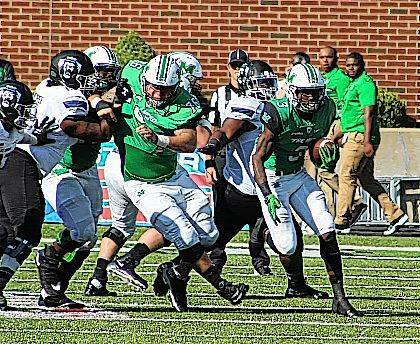 The Thundering Herd (6-1, 3-0 CUSA) became bowl eligible with a relentless ground attack that churned out 198 rushing yards and four touchdowns, not to mention a defensive effort that produced a pick-six and held the Blue Raiders (3-5, 1-3) to just 273 total yards of offense. MU led only 7-3 after one period of play, but the guests reeled off 24 second quarter points while cruising into halftime with a sizable 31-10 advantage. Both teams went scoreless in the third canto, but the Herd tacked on a late fourth quarter score to wrap up the 28-point triumph — its largest margin of victory on the road this season. Tyler King ran for 129 yards and two touchdowns on 23 carries, while Keion Davis added 40 yards and two TD runs as the Green and White finished the evening with 366 yards of total offense. Marshall played an error-free game and ended up plus-2 in turnover differential, putting them at plus-3 for the season. Artis Johnson returned an interception 17 yards for a second quarter touchdown. Kaare Vedvik also added a 25-yard field goal just before the intermission. The Herd picked up its third straight road victory, a first for the program since the 2015 campaign. The guests are also 5-0 in games this year when scoring first. A complete recap of Marshall’s road victory over Middle Tennessee will be available in Tuesday’s edition of the Point Pleasant Register.